Did I tell you I have been having a lot of cravings lately? Not all healthy I'm afraid. There's coffee ice cream with chocolate fudge sauce, nutella doughnuts. Do you see a trend here- anything with chocolate will do. However, there is one healthy snack I've been munching on guilt free. Nature's jewels, I like to think of them a nature's rubies. Pomegranates. Even their name sounds regal. Did I tell you my mum's name means heaven's pomegranate in Farsi- Anar. Although it's a messy affair trying to get these treasures out of their shells, especially when a keen 2 year old helper is involved, the results are worth it. Maryam loves to peel them because that means she can eat them straight away. Raw and fresh. Other times, we coat it in some thick, creamy yoghurt infused with vanilla seeds. Since moving to Dubai, pomegranates have featured commonly in our meals- as garnishes on hummus and pilafs, as refreshing cocktails, as tangy marinades. But my favorite use of this is in a fattoush salad. My very own individual salad as Akber describes it. Yes, I eat this solo when I make it or order it at a restaurant. It really is too good to share. The crackle of the Arabic bread, the marriage between sweet and savory, the crunch from every mouthful of peppery radish, the juicy explosion of each cherry tomato. That is how I would describe fattoush. 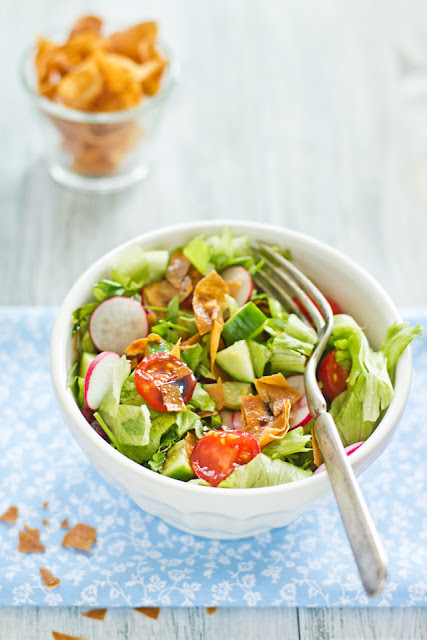 I have included a recipe for pomegranate molasses too, an essential part of this salad. 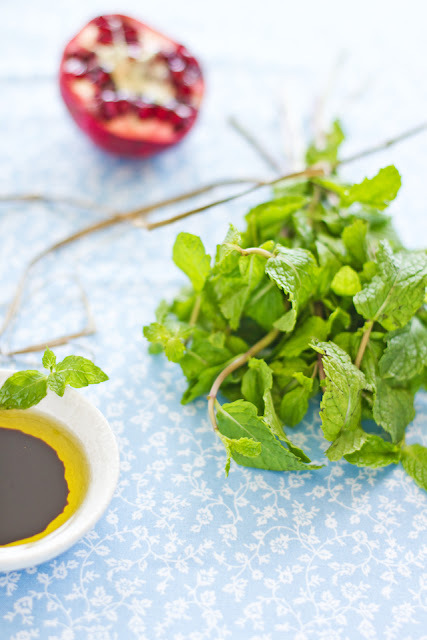 Although it is readily available in Middle eastern countries, it is so easy to make at home. Put all the ingredients in a saucepan and simmer on medium heat. Keep stirring once in a while for approximately 1.5 hours until the liquid has reduced by half and has thickened. Allow to cool before storing in the refrigerator for up to 6 months. Recipe minimally adapted from Alton Brown and makes approximately 1 cup. Mix all the salad items in a bowl and toss to mix (except the fried phyllo dough). Prepare the dressing by mixing the oil, molasses and salt. Stir vigorously but you will notice that the molasses and oil will not mix due to differences in viscosity. Apply the dressing just before serving and sprinkle with the fried phyllo dough. Simply beautiful (the jewels, the photographs and the recipe). This is the season for Pomegranates here and we do not get it all year through.. how unfortunate. But we do make the bestest use of it:) mostly raw. they go away so quick that I barely get a chance to do anything with them. love it with yogurt. I do need to try to make the molasses. Love Love Love..the pictures..so crisp! I m starting to see pomegranates here these days..cant wait to try your molasses recipe.. tomatoes..mint..pom..cuke..pita..there's not a single ingredient that I dont love here..cant wait to try asap! Fattoush is something I used to munch on daily with kubhous by the side when I worked in QP, and was pregnant with my second child :) I particularly love biting on to the crispy bread pieces. I make this at home often but without the radish. Simply loved your colorful shots Sukaina. Can't take my eyes off! A delightful salad! I really love pomegranate molasses. I use that ingredient a lot. I must make my own now! gorgeous! I'm going to try the molasses. Jewels indeed, pomegranates are just so beautiful! I love fattoush and the addition of pomegranate molasses and seeds is a new and interesting twist I will have to try. Such a gorgeous salad! I love pomegranates,too, but I haven't seen them in the market yet. Your photos are spectacular! I want that salad--not sure if there are pomegranates up here yet, though. Pretty pretty pomegranates and radishes. Love this salad. I also add sumac. 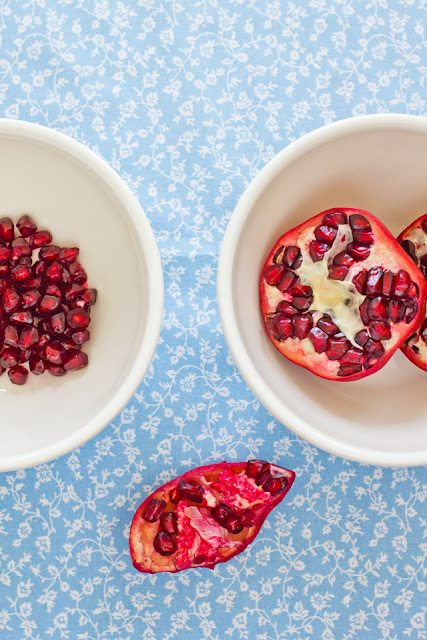 Until very recently, I hadn't known about Pomegranate molasses.. Now that I know, it seems like just the thing to do with these ruby red beauties..Sounds like a must try! First pic and the picture of pom juice in a bottle are my personal favorites here.. This sounds wonderful! 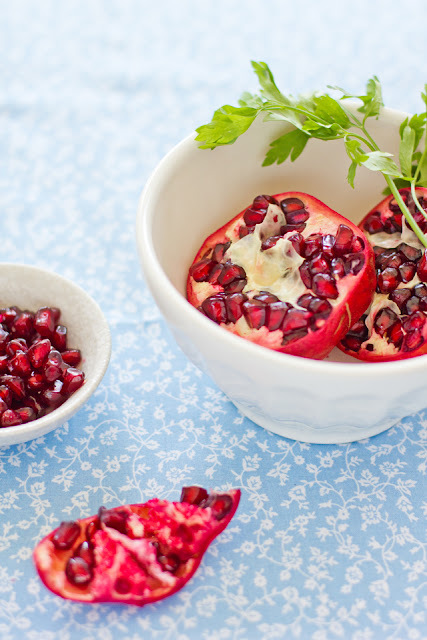 I love pomegranates and I love they are so available here in the Middle East! Is this a traditional fattoush salad? I've seen them on menus in restaurants here but have yet to order it. If this is what I'd get, I would order it everytime!!!! Hey sukaina! Amazing photos as usual mashAllah, simple and great recipe will give it a try! 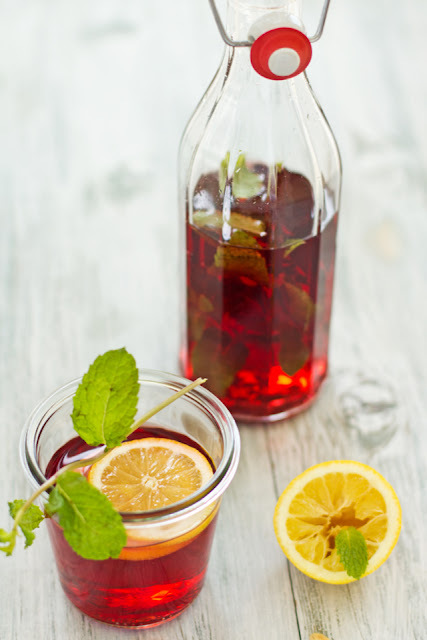 lovely refreshing post early in the morning... love to try the pom molasses!! pomegranates are certainly as beautiful as jewels aren't they? i recently made a chicken pate with pomegranate molasses and just loved it! i think i'm going to add it (the molasses) to everything from now on. I love that pretty bottle you have the pomegranate molasses in! I adore pomegranates, I just wish they were easier to eat. I guess the time it takes to peel and get to those little gems makes them extra special. beautiful- pomegranates are a favourite in our family ....the first picture is my favourite- love the blue bowl! i love this salad and the molasses looks gorgeous. that color is hypnotizing ;-) will definitely make this :D i enjoy eating anaardaana with yogurt too..its so good ! Both salad and that beautiful molasses looks super stunning, wat a fabulous clicks..
amazing posts with nice presentation..
one of my favorite salads too! I can have fattoush anytime of the day. As for pom, I think you rightly called it nature's ruby. And you make them look like it too! Refreshing and beautiful. Stunning work S! I have some poms on hand...must find time to make molasses and then this beautiful salad! Hugs!! 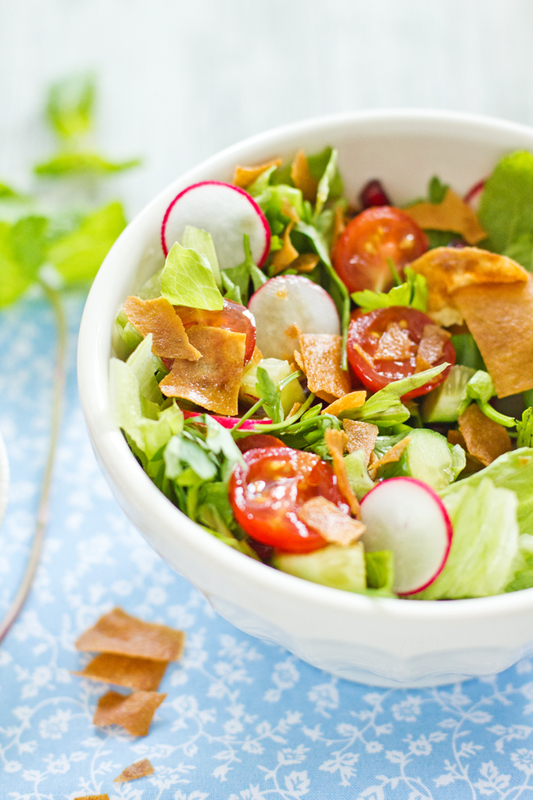 Looks so amazing, and fattoush is one of my favorite salads of all time. I'd love to try making pomegranate molasses from scratch - my friend and coauthor on midEATS, Brenda, talks about using it in cooking all the time! Till now, I haven't yet used it in any of my cooking! Shameful, I know :) Anyway, lovely pictures and blog. Stunning pictures!! and love the pomegranate molasses. This one definitely needs bookmarking! Arabic cuisine has a distinctive and exotic taste. I don't know, but it makes me think of royalty and kings and sheikhs...Very regal and hearty! 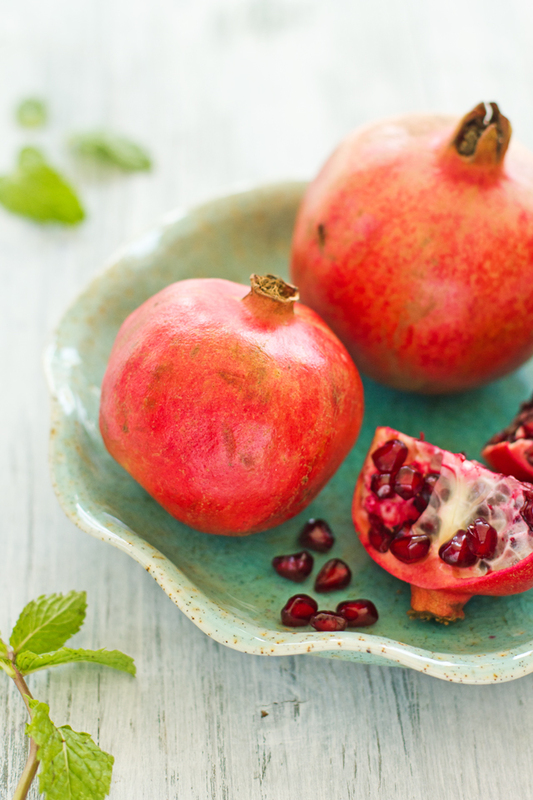 Pomegranate has the same distinction in the fruit kingdom. (Do tell me...do I read a lot of fairy tales based on my thoughts nowadays? LOL!) The seeds look like Ruby jewelry sets glistening in splendor. I love your recipe, really a must try. that looks absolutely amazing - and I am so jealous of the light you have, we are in the middle of gloomy autumn so the light can be tricky. Great healthy salad,and amazing photography,that pomegranate molasses sound interesting. Beautiful photographs! I love pomegranate a lot! I love this post!! the Arab salad looks so divine, so full of color, so vibrant... just mouth watering!!! You amaze me with your ability to make a simple salad look too beautiful to eat! Although I'm sure it tasted delicious! your pictures are so beautiful, styling as well. and the salad looks exactly like the one i had in dubai. i never managed to make it as good myself. must try your recipe! Really beautiful and I love pomagranate molasses and how wonderful to have homemade on hand. I am intrigued by this salad which is almost like a Middle Eastern version of the Italian salad. 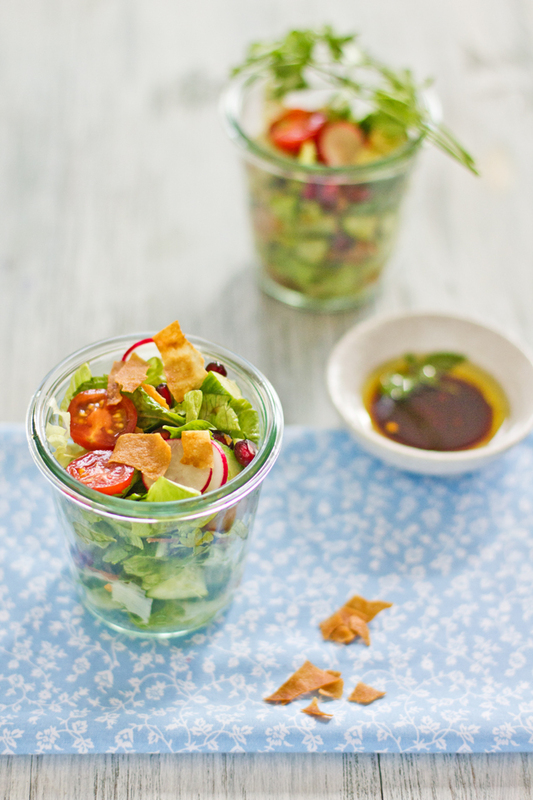 That is one beautiful salad Sukaina :) I only need pita bread and pom to complete this recipe. Must make it for my BFF who is an Arabic! Whoa! What presentation....!! B-E-A-utiful! My mouth is already watering.....a must try this weekend! So beautiful! We don't have great fresh pomegrante here, so sad. That looks so delicious. Like you I'm on a pomegranate thing at the moment. Just love them and I have to make the most of the season which is short enough! Can't wait to try your recipe... Beautiful!!! Lovely photos. The fatthoush salad looks great, I like this specialty a lot. If you crave pomegranates anywhere in between those other sweet treats I'd say you're lucky! :) Not just because they're delicious, but so healthy as well. Fattoush is such a nostalgic salad for me - it's what I grew up on, and now make it frequently with plenty of fresh mint from our little greenhouse. Martha Stewart taught me (well, and all her readers) how to quickly de-seed pomegranates: cut around the fruit (not totally through it) then pull apart. Place seed down in your palm and tap the skin strongly with the back of a wooden spoon. Works every time. Nice recipe and beautiful pictures! Gorgeous, gorgeous photos! I love fattoush and I LOVE pomegranate molasses. I had no idea that it's so simple to make at home but am thrilled that this is the case, as I just moved to Thailand and have no idea where I'd find it here. Thanks for sharing! Would I be able to use lavash as a substitute for the pita...or even use pappadums (broken into pieces? )..The latter option would make gluten-free for readers with this concern!..Loving your blog...and this post...is archived permanently! Donna- Thanks for visiting. You can use any flatbread as long as it's nice and crunchy. 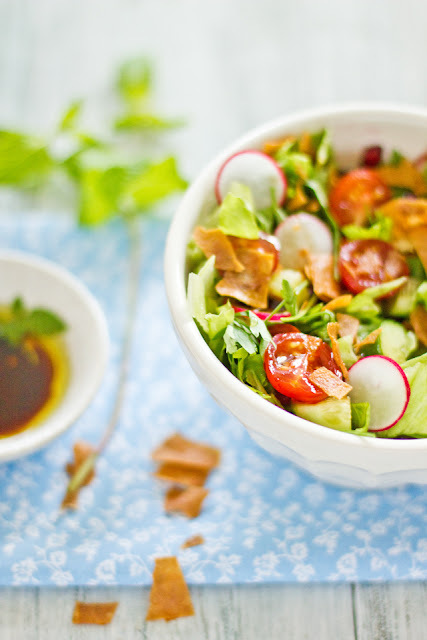 I love fattoush salad and your pics are just beautiful! I wish I was half as good as you with the camera! If you get the chance check it out! I've just find your blog and I love it!!!! Thanks for sharing interesting message for us because people always wait for this. The salad looks awesome! Thank you for sharing the recipe!